Stock Markets are going through a very bad patch. It’s a mix of both domestic and international factors that are responsible for the recent meltdown in stock markets. In the beginning, of this month, i shared a post, Investment in 2016. I highlighted the factors that will influence the returns in 2016. I was hoping against hope that markets will stabilize. It seems that currently everything is going against the stock markets. The recent developments are not encouraging. In my opinion, the danger of panic selling is looming large on Indian stock markets. I am not an investment adviser but my conclusion is based on my personal assessment. According to definition available on the web, panic selling in stock markets is wide-scale selling of stocks. It causes a sharp decline in the stock price. In other words, investors just want to get out of the stock irrespective of stock price. Investors start selling without any consideration of stock price. It may lead to free fall of the market. The best examples are current situation in Chinese stock market or what happened to Indian Stock market in 2008. Before i proceed, i would like to clarify that objective of this post is not to create panic but to caution the investors. The points shared by me are based on information available in public domain. The objective of this post is to caution the investors. You should trade cautiously. 1. Retail Investors are exiting the stock markets: According to recent reports in newspapers, the trading volume has dropped sharply. The data from mutual fund houses also suggest that fresh investments are lowest in last 18 months. The fund houses have started feeling the heat of redemption pressure. The key reason is one year -ve returns of best performing mutual funds as i shared in my post, Why Retail Investors lose money in Stock Market. Retail investors are gradually losing patience. Till now DII’s were supporting the market but if retail investors exit then there will be free fall in stock markets. 2. Accelerated FII Selling: From the beginning of this year, FII’s have accelerated their selling activity. As per the reports, this year FII’s have already taken out approx 5000+ Cr and FPI’s no’s are 3500+ Cr. As a retail investor, i keep a watch on daily FII trading activity. From last 10 days, the net selling of 1000 Cr is now new norm for FII’s. The accelerated FII selling shows that they are becoming impatient or anticipating some more bad news. If this trend continues for some more days then DII’s will also join. It will be a compulsion for DII’s because of less inflow and redemption pressure. 3. Weak Q3 earnings: The Q3 earnings was the last of hope of stock markets. The initial results have hinted that last hope will only remain hope. Except for IT companies, none of the companies are expected to perform better. I highlighted this multiple times in my previous posts that it will take at least 3-4 quarters for improved earnings. The only hope of stock markets was because of Diwali Quarter. Traditionally, Q3 or Diwali quarter is the best quarter for consumption story. As a common man, i could not find any enthusiasm among shoppers this Diwali. The overall sentiments were subdued. Some of the companies that delivered strong Q2 results are also looking vulnerable during Q3. 4. Crude Oil Prices: When the crude oil price was around $120 per barrel at that time economists were praying that prices should come down. Their prayers were answered generously, but they never imagined $29 per barrel. Now they are praying for an increase in crude oil prices to around $70 per barrel. I am skeptical that their prayers will be answered this time. According to recent reports crude oil may touch $10 per barrel due to oversupply. The reason being, the sanctions on Iran is lifted that will lead to more supply. This will cause shivers worldwide. Currently, it is one of the biggest threat to the world economy. Any sharp decline from this point will have an indirect impact on stock markets. 5. 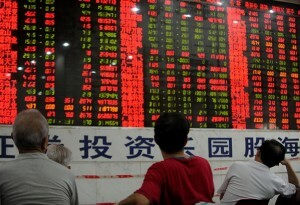 Chinese Rout: Though Indian Stock Analysts are putting a brave face in front of cameras. They are claiming that Chinese Economy rout will not have any impact on Indian Economy or stock markets. I do understand that they have their own compulsions to take this stand. It is quite laughable. My simple question is when the meltdown of Greece economy (Ranked 44) in the world can cause jitters worldwide then why china is an exception. Please remember that China is World’s Second Largest Economy. If somebody say that it will not impact much then there are only 2 scenarios. First, he is not aware of ground realities or second, he is under some compulsion to say so. None of the analysts have shared single logical reasoning for their stand. 6. Critical Support Levels are Broken: The market tried to take support near 7500 but convincingly broke this key support level. I was hoping that 7500 will not be broken and the market will stabilize near 7500 before next move. Currently, it seems that support levels are meaningless. Like in 2008, stock markets collapsed like a pack of cards. There is a set of investors who keenly watch support levels. If you are one of them then be cautious. After the level of 7500 is broken, the next level is 7250. My personal analysis shows that if 7250 breaks then panic selling will trigger. In this case, the bottom of stock markets is anyone’s guess. 7. The collapse of Banking Stocks is not a good omen: In my personal opinion, banking stocks are the true reflector of an Economy. Today i was reading a news article that market capital of ALL the listed Public Sector Banks including SBI is just ahead of MCap of HDFC Bank. There are 20 listed PSB’s. There are two ways to look at this data. First, the HDFC Bank is going strong and is best among the lot. The second way to look is that Public Sector Banks either collapsed or are on the verge of collapse. It is not a good sign. When SBI moved below Rs 200, trust me it gave me goosebumps. It shows the deep rooted problem in stock markets that is not visible to retail investors. Words of Wisdom: Today nothing much to say. The post is self-explanatory. In my opinion, it is time to trade very cautiously. An investor should look out for positive triggers to remain invested. The cocktail of all the bad news will take stock markets to new lows that were never seen before. I wish that day will never come but for that, too many prayers should be answered as i shared in my post :).